Many of today’s high school students have little insight into the basic day-to-day operational decisions and challenges faced by Agricultural producers. Therefore, there is a need for the development of ag-centric and dynamic educational material. Furthermore; there is an even greater need to provide high-school instructors with innovative classroom materials and instructional tools that are conducive to the structured conveyance of ag principles. Targeting the need for these innovative ag educational materials within Arkansas classrooms, this project presents an dynamic lab activity with emphasis on introductory level subject matter about Arkansas swine production systems and the related greenhouse gas emissions. Due to the particular nature of the subject matter, the activity materials were crafted into two complementary products for practicality. The first product is a compilation of swine production reference materials including: terminology and layman definitions of Arkansas swine management strategies and the basic dynamics of greenhouse gasses (CO2, N2O, CH4) as they relate to swine production. The second product is a scenario based critical thinking exercise, implemented from a manipulative decision-tree platform. Educate students within the state of Arkansas about the various management systems intrinsic to swine production operations within their state. This project presents an dynamic lab activity with emphasis on introductory level subject matter about Arkansas swine production systems and the related greenhouse gas emissions. The activity materials were crafted into two complementary products for practicality. The first product is a compilation of swine production reference materials including: terminology and layman definitions of Arkansas swine management strategies and the basic dynamics of common greenhouse gasses (CO2, N2O, CH4) as they relate to this activities scope of swine production. The reference material serves as both an introduction to basic ideas and practices native to swine production and GHGs, and as a guide which aids the students in completion of the second product (lab activity). The second product is a scenario based critical thinking exercise, implemented from a manipulative decision-tree platform. 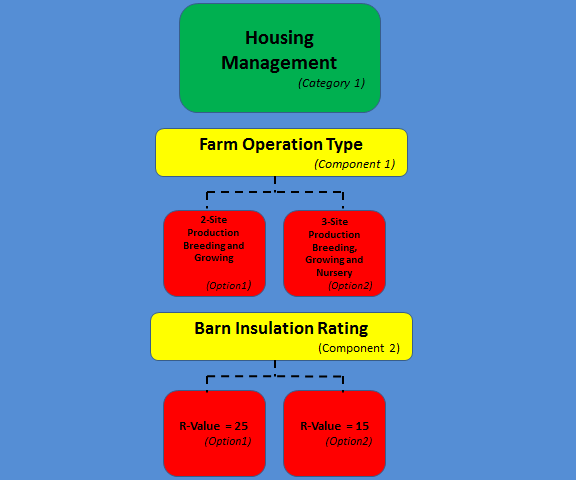 Flashcards are used to represent three specific swine management systems using a three tier hierarchy. This hierarchy is distinguished by the allocation of Categories, Components, and Options. The “Categories” are the designated ranking class and will represent three major swine production management systems: Housing Management, Waste Management, and Feed Management. The “Components’ are the first sub-order class, and are used to represent various functions/considerations that comprise each “Category” of production system. The “Options” class holds the lowest position within the hierarchy and represents the different configurations/settings for the individual “Components”. For the context of this exercise the students will act as consultants hired by a producer to design the three management systems (via the flashcards) to “best match” the producer’s desired specifications, as defined within by a supplied catalog of unique scenarios. Graphical reference to the hierarchical structure of the manipulatives used within this project’s lab activity. Implementation of this project’s developed lab-activity within Arkansas’ high school classrooms via the Arkansas Farm Bureau supported (Ag-In-the-Classroom) program. Special thanks to Donna VanDevender (High School Science Teacher-Bauxite Arkansas) for her insight into the development of the materials and for providing the opportunity to conduct trial runs of the lab-activity.